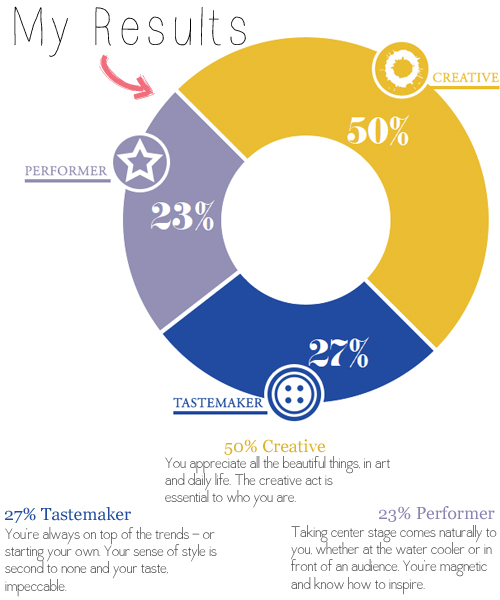 I'm a Creative, Tastemakin' Performer - What's your Archetype? I've always dreaded when you're in a new group setting and the person in charge says, "Okay, everyone go around, say your name and something interesting about yourself". Ugh. It always feels so awkward to me, especially if you're at the end of the circle and have to follow up the, "I've been skiing in the Swiss Alps, guy" and "I birthed my first baby in under a minute, and with only one push, girl" (honestly, these are real-life examples from this type of exercise that I've been in before). It's not that I don't have anything interesting to say, but when people don't know me at ALL, everything "interesting" sounds braggy to me. I wish people would ask a different question in those circles, like: "Tell us about the latest thing you created" or "What was the last song you downloaded on your phone, to jam out in the car to?" I feel like this would tell me SO much more about a person, and who they really are. 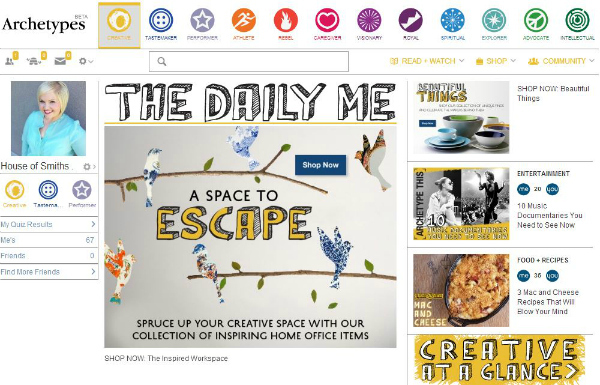 All this being said, I was totally intrigued with Archetypes.com, when they asked me a few weeks ago if I wanted to test out their website, to see what MY personal archetype was. Have you seen or done this yet? Basically, you sign up, take the quiz and then it breaks up into percentages what sort of archetypes you possess. I have to say, I'm not complaining! The creativity description definitely describes me as a person the most I think, and the other two are more flattering than anything :) You can head over and take your own quiz, to see what it says about you. The questions are somewhat interesting; I'd love to know what you think of them. Once your main archetype is determined, the site directs you to all things that deal with that category. Articles, ideas and best of all... shopping! And because everything can be filtered through specific archetypes, most of the things pushed your way are completely related to you; without having to sift through products or topics that you aren't really interested in. I also created a ME board. It's basically like Pinterest, but I've been filling mine up with only items I can actually purchase; either from suggestions made on Archetypes.com or anywhere else on the web; feel free to friend me so we can follow each other! And okay, I'll admit, some of them are just "yeah right, only if I had a million dollars" kind of items... but nonetheless, everything collected has an actual link to a location where it can be bought! I love having a separate place for that now. I know at this point you're probably intrigued as to what archetype YOU are, right? Yeah, well so I am! I'd love to see our readers' results on this quiz, because it would tell us a lot about our audience, and what motivates THEM. 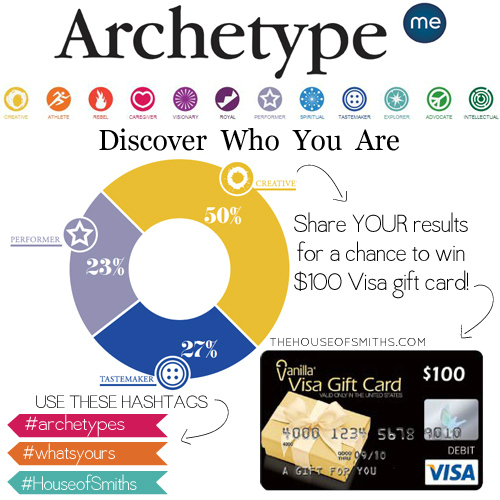 So to get you moving, and because we REALLY want to see what archetypes all of you are, we're throwing in a chance to win $100 Visa gift card, to any of you who are willing to share your quiz results with us! Simply head on over and take the Archetype quiz. Then, share your results wheel via any of your social media channels, using the hashtags #archetypes, #whatsyours and #houseofsmiths so we can see them! You can quickly share your wheel, by using the social media buttons below your results when they pop up. If you don't have another social media outlet to share your results to, just leave them in a comment below. Once that's done, just fill out the following Rafflecopter widget, to be entered for a chance to win the $100 Visa gift card, and you're done! I'm pumped to see what all of you come back with as results. It's always fun to learn more about yourself, and see what specific things motivate, inspire and drive you as a person; whether it's in tough decision making situations, or just daily life in general. This post was sponsored by Burst Media. Regardless, I only post about products or companies I love. All ideas and opinions are 100% my own. I am 46% caregiver (friendly, sincere, and compassionate), 33% spiritual (seeking a deeper meaning) and 21% intellectual. I would agree that I am pinned correctly! I got caregiver, spiritual, and intellectual! Woot! That was fun! I am 61% Creative, 26% visionary and 13% caregiver... looking forward to exploring the website. Thank-you for sharing! That was so neat! I'm feelin lucky! My results were 46% Caregiver, 33% Spiritual, and 21% Creative. I would say those results describe a good portion of who I am. Friendly, sincere, and compassionate, you find your reward in helping others. No one could ask for a better best friend. You seek a deeper meaning. For you, the journey of faith is never-ending. Thoughtful and compassionate, you have a strong sense of moral obligation. You’re the ultimate dinner-party guest. Engaging questions and thoughtful debate are your trademarks. https://www.facebook.com/jillian.jefferies/posts/10152243140179746. This was a fun accurate quiz. I pinned my results. Very cool! oooh loved this - this quiz was so interesting! I knew I was creative (I mean, I'm here on your blog, aren't i? lol) but the visionary part was interesting...the caregiver part, not too much of a shock, I mean, there's a reason I'm a nursing student ;) Now..off to make cards! Would love to win this - I'm dying to make one of the tufted headboards that I keep seeing on pinterest! The first two are dead on. And, I have to say that I was a bit surprised with my results. Mine was spot on too. 52% spiritual, 24% creative, 24% caregive. Can't wait to see what my options are! You appreciate all beautiful things, in art and daily life. The creative act is essential to who you are. You’re always on top of the trends—or starting your own. Your sense of style is second to none and your taste, impeccable. I am a caregiver (44%), creative (39%), and royal (17%). I'm creative, caregiver, & visionary. I'm a creative, intellectual caregiver...not too surprising! I love quizzes like this. :) I'm Creative, Caregiver, and Advocate. This was very interesting!! loved it!! Thanks for the chance to win! I don't have another outlet to show my results, but they were: 58% caregiver, 25% intellectual, and 17% athlete... I think it's pretty accurate! How fun! Excited to see what else I find on Archetypes! My Archetype profile is 50% intellectual, 27% spiritual and 23% caregiver. I am 42 athlete 33 caregiver 25 explorer. I took the test. I'm 64% creative, 18% tastemaker and 18% intellectual. Fun! https://twitter.com/JDenouden/status/386640719936364544 I REALLY enjoyed taking this quiz! I love these kinds of test! they are super fun and interesting. Interesting quiz. Surprisingly close to how I see myself. I'm a performer explorer caregiver! Fun quiz - reminds me of the old days when I sat around taking all the quizzes in Seventeen magazine. I'm a creative, caring, intellectual. Completely agree with the results. I am 50% Caregiver, 35% Spiritual, 15% Advocate. My quiz said I'm 43% Creative, 33% Caregiver, 24% Spiritual. Really neat quiz! 38% Spiritual 33%Caregiver 29%Royal ... !!! https://twitter.com/Coppy92212 43% Caregiver, 35% Taste Maker and 22% Royal! Wow! So interesting! I am up there with you, 1) Creative 2) Tastemaker 3) performer... I never really thought of myself as a "tastemaker", but I definitely follow the trends :) After all, I follow your blog! Hmmm, not sure how I feel about mine 44% caregiver, 34% intellectual, 22% explorer. Mine wasn't shocking LOL...50% creative, 18%caregiver & 18% intellectual https://twitter.com/MoreBitzofMe is where I tweeted it with the hashtag...cool site & thanks for sharing it! 41% Intellectual, 37% Creative, 22% Caregiver. How very Interesting!